But on my Arch Linux pre-packaged kak, invoking it, does not open the default **scratch** buffer. Bottom line is that my pre-packaged kak does not have a scratch buffer. I’m wondering if my configuration or if other flags were passed during compilation of kak. But I guess if it’s the latter, the maintainer is obviously whom to ask in this case. scratch buffer, but not every scratch buffer is the *scratch* buffer. flag that shows up in the status line for every scratch buffer. @Screwtapello thank you. I always go through your detailed answers. I do appreciate it. I don’t know what system you’re running, but on Arch Linux, (not the derived distros), a pre-packaged Kakoune does not, unlike a compiled kakoune, open the notes buffer named **scratch** (as Emacs usually does). Interesting, the compiled version showed - in addition to the warning (notes) of the buffer named scratch - the compilation of the gcc-libs that were used for the compilation. But the pre-packaged Kakoune only shows the date. Perhaps some users prefer this ‘feature’ of not having the notes, but I’m certainly not among them. The notes serve as a warning, that the buffer itself won’t be automatically saved. 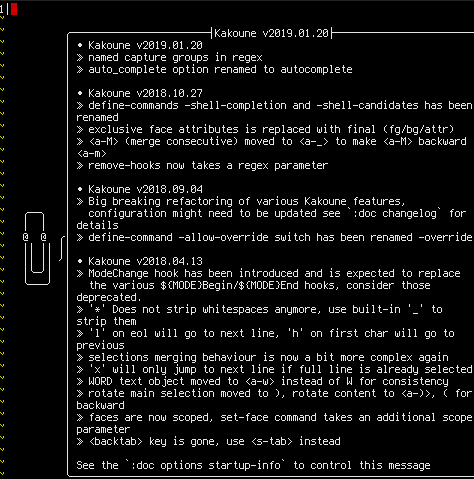 I don’t know what system you’re running, but on Arch Linux, (not the derived distros), a pre-packaged Kakoune does not, unlike a compiled kakoune, opens the buffer named **scratch** (as Emacs usually does). automatically-created *scratch* buffer is empty, with no message. “g” before the commit ID, but that’s what it does).